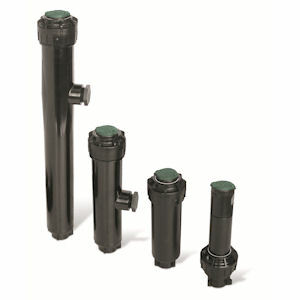 Rain Bird’s 5000 Series Rotors distribute water from 25 to 30 ft. Featuring Rain Bird’s industry-leading Rain Curtain Nozzle Technology, these rotors deliver a uniform spray pattern for superior distribution uniformity. Larger water droplets resist inefficient misting, airborne evaporation and wind. Gentle close-in watering eliminates dry spots around the rotor, prevents seed wash-out and allows turf to grow healthy with no matting or bending. Optional features include flow shut-off, in-stem pressure regulation and Seal-A-Matic (SAM) check valve.